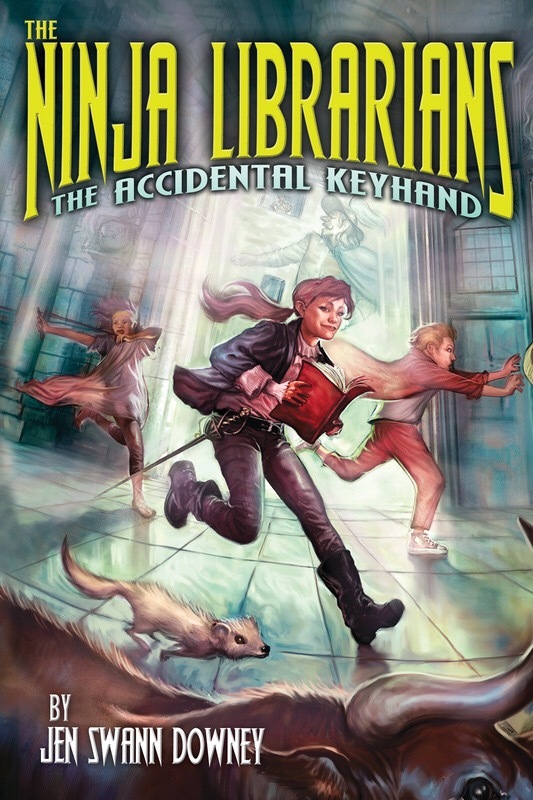 Obviously, I was going to read a book called THE NINJA LIBRARIANS, and Lilah (age 9) was excited about reading it aloud. She wanted to make sure I put in my review that it’s awesome, so: it’s awesome. Downey starts off the story telling the reader how ordinary twelve-year-old Dorrie is: “thoroughly un-chosen, not particularly deserving, bore no marks of destiny, lacked any sort of criminal genius, and could claim no supernatural relations. Furthermore, she’d never been orphaned, kidnapped, left for dead in the wilderness, or bitten by anything more bloodthirsty than her little sister.” Dorrie is unusual in one way, though: she longs to fight with a sword in real life, not just at Mr. Louis P. Kornberger’s Passaic Academy of Swordplay and Stage Combat. She also lives in one wing of an old mansion owned by her great-aunt Alice, who has mysterious visitors, with her parents, her fourteen-year-old brother, Marcus, and her four-year-old sister, Miranda, whose habit of stealing shiny things will affect the story. After agreeing to duel with snotty Tiffany (a real fencer) at the Pen and Sword Festival, Dorrie ends up chasing a mongoose named Moe into the public library and, with her brother, plunges through a supernatural portal into Petrarch’s Library, a library outside space-time with archways leading to “spoke” libraries at many different “wherens” (points in space-time). The lybrarians (with a Y) of Petrarch’s Library use these archways to defend the written word from all who would suppress it, particularly the Foundation. Several lybrarians and apprentices are suspicious of Dorrie and Marcus, but they are allowed to train while they wait for the new opening they fell through to cool off so they can return home. It’s a complicated setup, but Downey introduces it gradually and with great attention to detail. We learn as Dorrie and Marcus do, so the worldbuilding is integrated into the story and doesn’t feel overly expository. And it’s a fun premise. The lybrarians execute missions in different wherens to protect the written word and defend those whose words are censored. But there’s a traitor in their midst, and Marcus and Dorrie (along with their new friend, Ebba, an apprentice) will have to find out who it is while searching for a missing page to the History of Histories and trying to get an ancient Greek musician acquitted of blasphemy. Dorrie wants to help her sword fighting tutor win the woman of his dreams, and Marcus is mooning after the lovely Egeria, so the plot is jam-packed. Downey works plenty of historical figures and literary references into the book (with a helpful reference guide at the end). The strong anti-censorship mission is irresistible, and the plot moves quickly enough to make it a difficult book to put down. Lilah and I both recommend it highly. Source disclosure: Lilah received this book as a gift.